Assigning values globally "on the fly" through the Group Editing on Domain options. Selecting a subset of the network for contouring, annotating, etc. Restricting the database records that are available for editing using the Database Editor. Creating Selection Sets (see Selection Sets). Restricting model results to identify network components that are chosen as a part of a Domain. Select the Tools menu, and click on the Domain Manager . Select Domain and click on the Domain Manager . Click on the (i.e. Domain Manager) button, and you will see the following dialog box. Apply to Active Facility Only – This check box applies to active facilities created from the Facility Manager only. If not checked, selection will include all elements, regardless of active/inactive status. Map Selection – Pick the network components to be included in the domain in the map view. Using the mouse, drag and drop a rectangle around the area to be selected or select individual elements. When selection is completed right click and either select Enter to accept the selection or Cancel to disregards the selection and exit. Query Set – Define those network components to be included in the domain with a query set (a collection of individual database query statements). 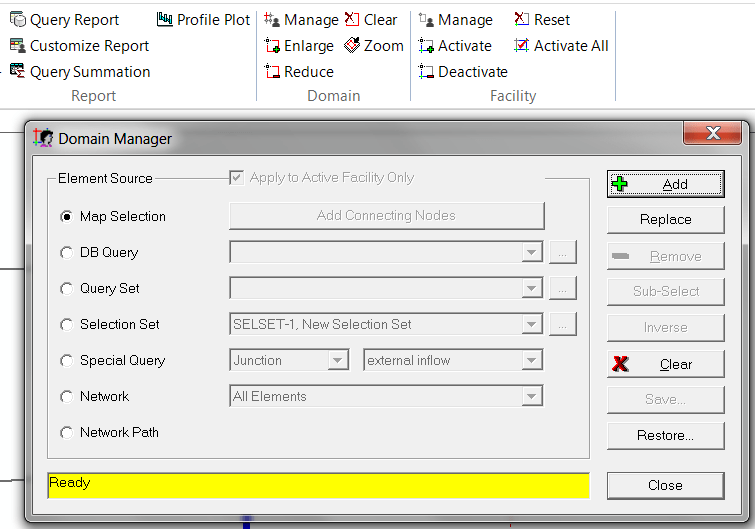 Selection Set – Include those components in an existing selection set into the domain. Special Query – Include all network components that meet the criteria of one of the special predefined queries. Examples of special queries are all rdii nodes, all controlled elements, etc. Network – Include all network components, or alternately, all components of a single component type, in the facility set/domain. Network Path – Allows the user to select a group of elements along a path by selecting the beginning and end node. A path is automatically selected connecting the beginning and end points and entered into the domain. The path selection process will attempt to find the shortest distance between selected node points. If a particular path is desired, short segments can be selected and joined together or added to an existing domain. Element Source Lets you specify or select the data elements to be included in the Domain. Map Selection – Pick the network components to be included in the Domain using the selection tool manually. DB Query – Define those network components to be included in the Domain via a database query statement. Query Set – Define those network components to be included in the Domain via a query set (a collection of individual database query statements). Special Query – Include all network components that meet the criteria of one of InfoSWMM ‘s predefined special queries options. Examples of special queries are all Junctions with external inflow, Conduits with non-circular shape, Subcatchments with initial pollutant buildup, etc. Network Options – Include all network components, or alternately, all components of a single component type, in the Domain. Network Path – The user select the starting node and the final node, and then the model includes all elements within the two nodes ( following the pipe direction) into a Domain. Apply to Active Facility Only This check box applies to active facilities created from the Facility Manager only. 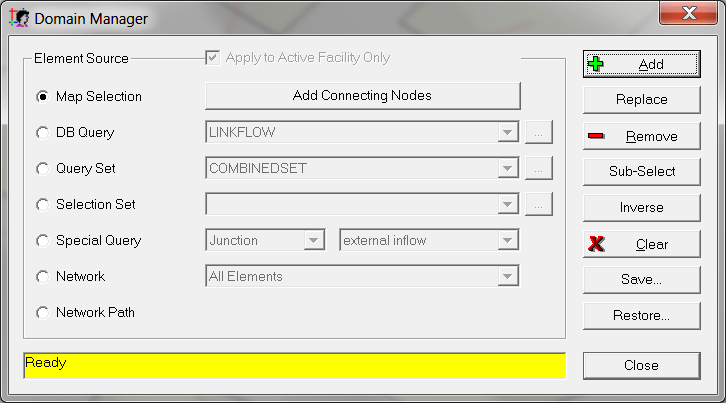 If not checked, an option like all elements will include all InfoSWMM elements, regardless of active status. Add Adds the specified components (using an option from the Element Source panel) to add to elements to the Domain. Once elements are selected and added to a Domain, you may optionally remove facilities from the Domain using the Remove button. Replace Replace the existing Domain by the new one. It clears the existing Domain, and creates Domain out of the newly selected elements. Remove Remove the specified components (using one of the options from the Element Source panel) from the Domain. This option is active only after you have added components with the Add buttons. Sub-Select Re-selects a graphically selected set of components from the current Domain and removes from the active Domain those elements not selected by the Sub-Select. Inverse Clears the existing Domain, and creates Domain out of the elements not currently included in the Domain. Save Remembers the Domain. You can retrieve this Domain at any time by choosing the Restore button. Restore… Retrieves the most recently saved Domain and activates that Domain.